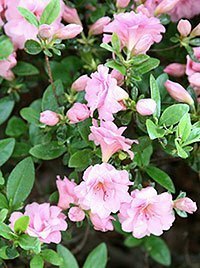 Growing rhododendrons and azaleas can be a challenge if you don’t have the right conditions. These plants are particular about soil, both pH and texture, and they’re sensitive to damage from drying winter winds. The key to growing these spring-flowering shrubs successfully is to recreate the conditions of their native habitat and to plant them in dappled shade with morning sun. Choose your site carefully: Avoid planting where strong prevailing winter winds can dry or desiccate the leaves. Rhodos need some sun for flower bud production, but they grow best if they’re in shade during the sunniest part of the day, both in summer and winter. Dappled shade under pines or oaks is perfect, but avoid planting them underneath maples, which have greedy surface roots. You can also plant them in the shade cast by a north-facing fence or the north wall of your house, as long as you avoid constant heavy shade. An east-facing location that gets morning sun and afternoon shade is ideal. 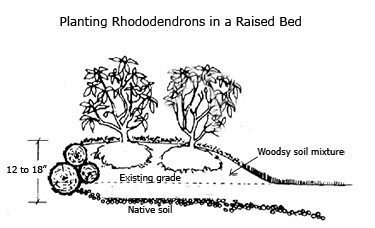 Acid soil is required for growing Rhododendrons: Your planting bed should be acid – around 4.5 to 5.5 pH – and well drained. To find out your soil’s pH level, test it with a pH soil test kit , or have it tested professionally. Don’t plant rhododendrons in clay soil. If you have heavy clay soil or alkaline soil, you can still grow these plants, if you create a raised bed at least 12 to 18 inches high, as shown in the diagram below. Fill this bed with a woodsy planting mixture that keeps the roots above the normal soil in your garden. For growing rhododendrons, incorporate lots of humus, such as coarse chunky peat, composted pine needles, leaf mold (composted oak leaves are especially good) and shredded pine bark or composted wood chips. This mixture allows for plenty of air around roots and keeps the soil on the acidic side. Ferrous sulphate can lower pH, but the effect isn’t long-lasting, as it leaches out. Many growers recommend sulphur to help acidify the soil. However, avoid using aluminum sulphate to acidify the soil because aluminum ions can build up and become toxic over time. The root systems of rhododendron and azalea shrubs are compact, with many fine, hair-like roots. You’ll often find that container-grown plants are quite pot bound, so you must loosen the bottom and the sides of the root mass to break it up a bit, so that the roots can grow into the soil more easily. Don’t plant your shrub any deeper than it was in the pot. After planting, layer a mulch of pine needles, shredded leaves or bark chips about three inches thick around your plants to keep soil moist and the roots cool. But don’t be misled into thinking that rhododendrons and azaleas don’t need watering: you need to keep your shrubs consistently moist (not wet) to help them get established. The rich woodsy soil described above should hold moisture, but you should water regularly if it’s a hot and dry summer. Don’t let these shrubs dry out. 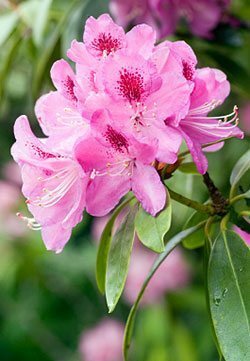 Fertilizer: Give rhododendrons and azaleas a light application of an acid-based fertilizer in early spring. Look for a balanced fertilizer for acid-loving plants; this type of fertilizer has nitrogen in the form of sulphur coated urea or ammonium sulphate. Avoid giving plants fertilizer after mid June; later fertilizer applications can promote stem growth that might not be able to harden sufficiently before winter. 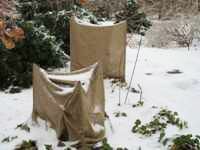 Winter care: Add extra mulch in late fall; this could be fall leaves, wood chips, or boughs from Christmas trees that help to catch and retain snow cover and give your shrubs some shade and protection from wind. Added protection like a burlap screen around the sides of the plants stapled onto wooden stakes is a good idea, especially for newly planted shrubs. Or instead you can spray your plants with an anti-desiccant such as Wilt-Pruf. This seems to be a tough word for a lot of people. Some common misspellings of rhododendron (rhodo-den-dron) are rhodendrum and rhododendrum. Remember, there is no “drum” in the plant name. Another interesting misspelling I’ve seen is Rohadendrium.